And that's all from us for the evening. Good night and see you soon! Over on BBC Radio 5 live, phone-in show 606 is already under way. The lines are open and you can have your say. Text 85058, call 0500 909 693, or it's @606 on Twitter. Aston Villa's next two games are huge. They actually played very well for at least the first half, and looked like cruising to victory when Carles Gil doubled their lead. If Tim Sherwood can pick himself up he'll look back at the game differently. It was a fantastic second half. We know they played better early on but after 2-0 we started to play with our spirit and it was a very fantastic match. We scored a good first goal that gave confidence to everybody and maybe Villa players were wondering what could happen now. Aston Villa manager Tim Sherwood, speaking to BBC Sport: "I’ve never felt this bad. Ever. There was a lot of bad play there in the last half hour. The only way you can stop the momentum is to stop the opposition. We turned it over stupidly. "What can I say? I’m gutted for everyone who’s associated with the football club. We have to stop letting in soft goals.Who cares if we played well? We lost. Totally lost. "The players are as disappointed as I am. They are a good group.We just have to stop the errors - sooner rather than later. We’ve got two big derbies coming up, so we’ll make sure we are right for them.We played some good stuff but we've come away with nothing." Stand by for a must-see interview from Tim Sherwood to the Match of the Day cameras. An excellent watch. We lost control when they scored their first goal. Unfortunately, we couldn't wrestle the momentum back from them. We kept giving the ball back to them. The game should have been finished with 30 minutes left because we were 2-0 up. It was individual errors - we aim to stop that. On reflection them goals from Leicester, they didn't have to work hard for them. We got nothing from the game so I'm bitterly disappointed. They played well for an hour and we were unable to wrestle the game back. Leicester manager Claudio Ranieri, speaking to Sky Sports: "It’s fantastic. We showed spirit, good character, after 2-0 I watched my players and they believed everything was possible. You can lose but it’s important to fight until the end of the match. It was an important victory to restart well and get three points, it’s fantastic. "I told the players we have 11 points and we still need 29. I don’t know when to achieve these points but as soon as possible. At the moment we want to think only about the safety of the team." We controlled the game in the first half. We knew it would be difficult in the second half. We didn't turn up in the second half. The first half they allowed us to play from the back. In the second half they moved up a little more. We couldn't play our game in the second half. We got a little complacent. As a new team we were always going to take time. But today when you're 2-0 up you should go on to win the game. "We must play this way in every match!" says Leicester boss Claudio Ranieri in a typically entertaining and candid interview. He says that his side need 29 more points to stay up. Thomas Glennon: Ranieri for Chelsea anybody..? Jonathan Ridgway: Sherwood's substitutions cost us the game. Takes off the goalscorer at 2-0 and brings on another striker? Text us on 81111 or tweet us at #bbcfootball. Aston Villa captain Micah Richards sounds and looks like a broken man as he goes through his post-match interview. "We didn't turn up in the second half," he admits. The team had great pace going forward. The second half we just needed to pick it up a bit more. Regarding my goal, the physio treating me told me I scored. I didn’t know beforehand. It was a nice feeling. I was just dazed - it was easy to get back up. It's a joy to play for a team like this. Aston Villa were in control for a large portion of that game, but with their 57% of possession they mustered eight shots, three of which were on target. Leicester, on the other hand, had 21 efforts, six of which hit the target. We came from far. It was a difficult game, especially in the first half. In the second half we did very well and scored three beautiful goals. Villa's second goal was my fault. I'm happy to help the team like that. We don't know how we will do this season. This game was very difficult. We'll see where we can go. A great start to the season for Leicester - and they face Stoke, Arsenal, Norwich, Southampton and Crystal Palace in their next five games. On this form they won't fear anyone. Bobby Goldendoodle: Leicester becoming modern day exponents of the Kevin Keegan school of tactics. Performance of the weekend. Chris Lawton: Foxes Never Quit! Back to 2nd in the league, what a win and what a start to the season! James Farmer: Only Aston Villa can go from winning 2-0 to losing 3-2 in 10 minutes. That's a club record nine games unbeaten in the Premier League for Leicester now too. Riyad Mahrez can hardly speak during his post-match interview. That's how hard they work. "I questioned Ranieri's appointment but that was a Leicester team playing for their manager with confidence, pace & power. Magnificent comeback." "Leicester's reaction in the second half was nothing short of a miracle. "Nathan Dyer is celebrating with his team-mates and they know he was a little bit special in this second half. He was the hero of the day, for the bravery of his goal. "Outstanding from Leicester. They go into second place in the table. Unbelievable." Second place! They must be second in the form table over the last 10-15 games too. There it is! Debut boy Nathan Dyer's brave winner has Leicester up into second place! Luke Rundle: What an epic fightback by Leicester! Who'd have thought that the Tinkerman could have kept up the form from under Pearson? James Farmer: I have never been so livid watching a football match... And I am an Aston Villa fan so I've had my fair share of disappointments. Riyad Mahrez runs in on goal and cracks a left-footed shot wide. He deserves a goal today. "Leicester only know one way to play and that's on fast-forward. I just feel Aston Villa stopped playing in this second half. "Nathan Dyer is running but he's in a lot of pain." I don't want to be a killjoy but I'm not sure Nathan Dyer should still be out there. He looks very groggy as he tries to control a pass. What a stirring second-half this has been. Tim Sherwood looks furious on the sidelines. He's just had no answer to the Riyad Mahrez show. "A fantastic goal. Nathan Dyer makes such a brave run and again it's Riyad Mahrez who picks him out. "He's been brave with the ball at the feet but he's also been physically brave there because Brad Guzan was favourite to get it. This is embarrassing for Aston Villa." What a turnaround from Leicester City! Substitute Nathan Dyer gets what must surely be a winner, though at some personal cost. A cross comes in from the right, Riyad Mahrez again, Dyer gets to the ball ahead of Villa keeper Brad Guzan to head home and is then absolutely cleaned out. Guzan's hip clattered into Dyer's face. He needed a long break for treatment but he's up, and the goal stands! Andy Longson: It must be so frustrating being an Aston Villa supporter. Chris Clarke: Chelsea lacking fight, intensity and drive, things Leicester are full of. Time for Roman to crawl back to Claudio? Demy: Mahrez should be a ballet dancer! Elegant and classy! He makes defenders look so silly! Riyad Mahrez is a man inspired. Now he beats his full-back once more and has a shot well saved by Brad Guzan. Is this going to end 2-2? I doubt it! In case you've missed it there's been a lot of chat today about players and the numbers they choose to wear (like Manchester City striker Kelechi Iheanacho, who's got 72). "This Leicester team is incredible. The energy of it all. Riyad Mahrez, running with the ball towards the box, Jamie Vardy just knows there's going to be an opening for him. "Aston Villa have only got themselves to blame. They've been inviting pressure." Bravo Jamie Vardy! Bravo Leicester City! Bravo football! What an excellent second half this has been, entertainment everywhere you look as Leicester draw level. Riyad Mahrez heavily involved again to drive into space, he pics out Danny Drinkwater in the right-wing channel and he then serves up a fine square ball for Vardy to attack, and slide into the net. Leicester have a free-kick in a dangerous area but Danny Drinkwater's hit is blocked. Gabby Agbonlahor has been a weapon on the counter attack but his race is run. On comes Rudy Gestede in his place. He won't run past anyone but he won't lose a header either. In both boxes. "We did say don't write Leicester off. They never know when they're beaten. It was a sliced header from Ritchie De Laet, from one post to the other. Beautiful. "Goal-line technology has rescued us. It's fantastic how it picks it out." Never write off Leicester Martin! You're quite right. From the corner following the penalty appeal right-back Ritchie De Laet flicks on a volley which hits the underside of the crossbar. Ashley Westwood clears it away but the officials decide - correctly - that the ball is over the line. Hello grandstand finish, nice to see you. "Claudio Ranieri wanted to tinker and he'd readied the changes just before Leicester conceded a second. But I just think he could have been a bit more patient because his side was on top and they needed time to develop. "I don't think you can totally write Leicester off yet though." Villa fans in 'ole' mood now as they cheer every pass to a claret shirt. A fine away day for them and their team so far. Ooooh hello! Jamie Vardy drives into the box and goes down, he screams for a penalty but Leandro Bacuna is having none of it and neither is ref Mike Dean. Peter Malath: Carles Gill. What a curler of a goal! Some beautiful goals from Villa today. Mark: Wow! Villa!! Where did that come from? Is there any chance of Leicester coming back from this? They have only lost one of their last 13 games in the Premier League. It had been all Leicester since the break but that worked like a dream for Villa. Both sides make changes. On come N'Golo Kante and Leo Ulloa for Leicester, while Villa send on Jordan Ayew for goalscorer Carles Gil. "It's the two playmakers - Jack Grealish and Carles Gil - who've won it for Aston Villa. I think that was even better than Grealish's. "Totally against the run of play, but Villa have just shown that extra bit of quality when they've needed to. A brilliant finish." Vintage, vintage counter-attacking goal from Aston Villa! The game was set up for it and they execute it perfectly. They win the ball in midfield, free Gabby Agbonlahor down the left and there is no catching him! He waits for support, picks outCarles Gilrunning into space in the 'D' and the Spaniard curls home beautifully first time. He set the ball off wide of the post, and it crept inside the near post. Another dangerous cross in from Leicester, Riyad Mahrez has the sniff of a chance but can't get a shot off. The home side are going to make a change. Riyad Mahrez is a new man, beating two defenders again before Gokhan Inler drags a shot wide. I believe Kelechi Iheanacho wears 72 because it adds up to 9 - the number he ideally wants to wear. A player at my club wears number 314. We don't have that many players, he just thinks Pi is a beautiful number. Villa's back two of Joleon Lescott and Micah Richards have won Premier Leagues and they are indeed doing plenty of talking and organising back there. Villa will be pleased to have got through that 15-minute spell and will now look to hit Leicester on the break. "It's delicious the way Riyad Mahrez just drifts past players. "The momentum has totally shifted now - Leicester are responding. For Aston Villa we're talking about leadership - you look to somebody like Joleon Lescott." Leicester a totally different side. Riyad Mahrez beats Carlos Sanchez with ease, bodyswerves past another man and then hits a low shot across goal which Joleon Lescott turns away. The hosts piling on the pressure as their fans make some fine noise. Jack Grealish loses the ball in a dangerous area and Leicester sniff an equaliser. They put Jamie Vardy in, he's miles too quick for Joleon Lescott but Micah Richards bails his side out with some wonderful defending. He eats up the turf and puts in a perfectly-timed slide to block it out. A proper game on our hands now. Plenty of huff and puff, rough and tumble. "What a lovely little backheel by Jamie Vardy. "Leicester have got a totally different attitude.That's lifted the crowd here again - this is more like the energy we've seen from them this season. Aston Villa haven't come out for the second half." Much better from Leicester! Jeff Schlupp powers on down the left wing and delivers a low cross Jamie Vardy gets to the near post and delivers a cheeky first-time backheel, it has Brad Guzan beaten but drifts into the side-netting. Schlupp then shoots wide from long range. Energy in the house. Back in play. Leicester need a boost. Nathan Dyer has gone extremely wide right, with Riyad Mahrez more central. Marc Albrighton has an instant shot saved by Brad Guzan. Here is Nathan Dyer, on for his Leicester debut in place of Shinji Okazaki. 4-4-2 is dead after all. By the way Villa fans - seen this? Tottenham striker Emmanuel Adebayor has been released from his contract by mutual agreement. Will he be seen at Villa Park any time soon? Villa's subs also warming up with some vigour. Tim Sherwood will be delighted with his side's showing so far. More of the same! The home side have looked a bit sluggish, and new signing Nathan Dyer is going to be on soon to try and change that. A very thorough warm-up from the former Swansea man. Harry, Leicester: Leicester City are tired. Lots of players hurting from international duty, Jeffrey Schlupp especially. Don't think this game is anything more than a blip. Well, now you mention it Ed, I don't particularly like it but it's excusable for a player who has played about four minutes of Premier League football. Fringe so far. Jack Grealish played 24 times for Villa last season. Got to be moving down the numbers. If Iheanacho plays a lot this season, let's have a number under 30. It's not the NFL. Ed, London: How must you feel about Man City's Kelechi Iheanacho wearing 72 then!? Villa on the charge in the as it stands table. Who - if any - out of those clubs will be in trouble at the end of the season? "Leicester just aren't showing the same energy and confidence they've had since the start of the season. They seem to have lost their way but Aston Villa have come back from the international break looking a completely different team. They're enjoying themselves." Jack Grealish's first Villa goal is the difference in a very decent first-half. Villa could have had a couple beforehand as Leicester have been uncharacteristically sluggish for long spells. Yes Matt! Let's make it happen. Scott Sinclair can put the number nine shirt away while we're at it. Sam Foster: Tim Sherwood deserves a lot of credit for giving Jack Grealish his chance... England should do the same and quickly! Matt Richards: Squad number nonsense annoys me too! Bring back 1-11! Or else 25 man squad must have 1-25. Leicester now forcing the pressure, but Villa are set up to counter well with plenty of pace up top. This is all working out nicely for Tim Sherwood. Leicester winger Marc Albrighton crudely chops down Carles Gil to stop exactly that - and he's booked. That's Jack Grealish's first Premier League goal and his first goal for Villa full-stop. Leicester look for a quick response and Riyad Mahrez's cross is almost flicked in by the lurking Shinji Okazaki. "A fantastic finish from Jack Grealish, he tucked it home through a sea of players. A confident finish from a really confident player. "And he went straight to Tim Sherwood to celebrate. That's no ordinary hug either - he lifted him off the ground. Grealish was hardly used under the previous manager." Well now they do have a goal! Aston Villa into a deserved lead and it's the game's brightest player, Jack Grealish, who has it. Leicester can't clear a corner, Carlos Sanchez and Micah Richards both have a swing at it but when the ball rolls out to Grealish on the edge of the box he opens his body out and curls it through a host of bodies and into the net. Not unlike Daley Blind's goal yesterday. He celebrates by sprinting over to hug manager Tim Sherwood. Villa still on top as we tick towards half-time. Scott Baird: Why are Leicester playing at such a slow tempo? One touch too many and lack of intensity. Expecting to win? Leicester have come off the boil after the opening 10 minutes but now Jamie Vardy wins a corner. Chance to send the big lads up there but as I mentioned earlier, Villa have plenty of height and Micah Richards heads clear. Keep him fit and Richards may prove one of the best free transfers around. "Aston Villa are matching the intensity of Leicester so far today. They're growing in confidence and the home side know they're in a game." Something wonderfully old-school about Jack Grealish isn't there? A touch of the Chris Waddle about the way he drifts past players, seemingly at walking pace. He beats two men after cutting in from the left but again his eventual shot is poor. Needs a bit of work. Villa have had over 63% of possession so far, and created a couple of fine chances too. Leicester struggling to get their front players into the game. Another excellent chance for Aston Villa, the sort they should be taking. Carles Gil wins the ball on the right and sets off on goal, he has the vision to look up and pick out Jack Grealish superbly on the left of the box. Grealish has time to set himself but his shot is very weak and Kasper Schmeichel could throw a cap on it. Gil was caught by Jeff Schlupp and needs a bit of treatment but he's OK.
Joleon Lescott ignores Martin Keown and launches a long, straight ball which Gabby Agbonlahor can't bring down. Not his game. Quarter of the way through the game, Villa should be ahead but it's a decent enough contest. "Everything Leicester do in attack always seems to be at such breakneck speed, it's not surprising their play breaks down. "The best we've seen from them has come down the right-hand side. There's been a nice pattern to Aston Villa's play and they seem determined to pass it out from the back." True enough Max. And to illustrate the point Villa left-back Jordan Amavi puts in a decent cross which Gabby Agbonlahor can't meet with any sort of power. Christian Benteke may well have done. Leicester come back at the other end though as Riyad Mahrez and Richie De Laet work it nicely down the right but the final cross is not great. Jack Grealish growing into the game for Villa, playing in a free role behind the striker. He's annoyed me though by not changing his number 40 shirt now he's a first-team regular.The number 10 is still available! A niche complaint. Villa playing some nice stuff now, Grealish to Scott Sinclair, and his cross is palmed away by Kasper Schmeichel. Keep your minor managerial indiscretions coming. I once saw Harry Redknapp go through the '10 items or less' aisle at a supermarket with what I estimated to be 14 items in his basket. Fight the good fight, Steven. Back to the action and Leicester danger man Riyad Mahrez has a curler saved easily by Brad Guzan. Steven Richards: Did I just see Tim Sherwood stick his chewing gum under his seat? Unconfirmed, Steven, but we'll bring you the latest as we have it. And now Wes Morgan heads over at the other end for Leicester. Decent game on our hands here, both sides look a real threat going forwards. "Gabriel Agbonlahor's pace is awesome but he put just a little bit too much weight on the cross. Too little pace and it would have been intercepted, too much and it would have run through. That's exactly what happened." Oh, Villa should be ahead! Robert Huth finds himself in a foot race with Gabby Agbonlahor, Wildebeest v Cheetah and Agbonlahor flies past him. On the left of the box, Agbonlahor could possibly shoot but decides to lay it across, he overcooks it though and Scott Sinclair has to stretch - putting it into the side-netting. A better pass and it's 1-0. Excellent start. Gabby Agbonlahor uses his pace to typical effect, winning the first corner of the day. Villa look a handful from set-pieces, plenty of height, and Carles Gil shoots wide after Micah Richards' header. "Danny Drinkwater had no right to be shooting there but it was dangerous and dipping. "It's been a high tempo start, with a lot of players committing early. I think a lot of the Aston Villa side have realised they will have to match Leicester's high energy levels at home." Not from there...! Great effort from Danny Drinkwater, a dipping 35-yarder onto the roof of the net. Leicester coming out with everything dialled to '11'. Shinji Okazaki gets his breath back and has a shot blocked by Joelon Lescott as Leicester make a very sharp start. "Joleon Lescott 'bodied' Shinji Okazaki there. Lescott made his mind up to go in full tilt, and Okazaki was lying on the deck for a while. "He'll have to get used to that." Joleon Lescott's first tackle for Villa is a cracker. Takes man and ball, leaves Shinji Okazaki in a heap. Wind out of his sails. 'Hey Jude!' drifts away from the speakers as Villa kick off. Someone's Sunday is about to be ruined. It appears that rumours of the death of 4-4-2 may be exaggerated and Leicester are going to treat us to the pros and cons of the classic system. Tim Sherwood is still all alone, on the bench now. Has he upset everyone?Leicester go through an elaborate group huddle. Here we go! Which of these sides will finish higher in the table? What is a realistic aim? Who are their main rivals? If you're a fan, what would you be happy with? My fear is Sherwood has too many average players and doesn't know his strongest team. Gil didn't get a look in last season but now he's playing ahead of the new arrivals. Didn't help he bought the wrong Ayew brother. Another relegation scrap for me I'm afraid but I would like to be proved wrong. Leicester: Schmeichel, De Laet, Huth, Morgan, Schlupp, Albrighton, Drinkwater, Inler, Mahrez, Okazaki, Vardy. Subs: King, Kante, Simpson, Kramaric, Ulloa, Dyer, Schwarzer. Aston Villa: Guzan, Bacuna, Richards, Lescott, Amavi, Sanchez, Westwood, Gil, Grealish, Sinclair, Agbonlahor. Subs: Clark, Veretout, Richardson, Ayew, Hutton, Bunn, Gestede. Banner of the day:"Get in to 'em. Ay up me duck." This afternoon's match is live on BBC Radio 5 live. Listen online, on your radio, in your car, on your phone or on this page! Just use the play icon at the top of the page and enjoy. The flags are waving around the King Power, in my experience one of the more blustery grounds in the Premier League, though no Stoke, as we close in on kick-off. More meteorologically themed updates to come. Atmosphere building. I can hear a bit of 'Holte Enders in the sky' from the away end. Both Tim Sherwood and Claudio Ranieri know all too well the perils of management and the fact that the sack is always hanging over their heads. Ben Dirs spoke to MK Dons boss Karl Robinson about the subject in this excellent piece which I urge you to read. Quote Message: Perhaps if managers revealed more, they would be abused less. Or perhaps the risk of revealing too much is too great for many to take. One of the unfortunate side effects of all this money sloshing around the game is that fans paying fortunes for tickets and TV subscriptions feel entitled to say what they want, to hell with the hidden consequences. Perhaps if managers revealed more, they would be abused less. Or perhaps the risk of revealing too much is too great for many to take. One of the unfortunate side effects of all this money sloshing around the game is that fans paying fortunes for tickets and TV subscriptions feel entitled to say what they want, to hell with the hidden consequences. Draw written all over it? At home, the Foxes have suffered just one defeat in their nine Premier League games against Aston Villa (W4 D4). 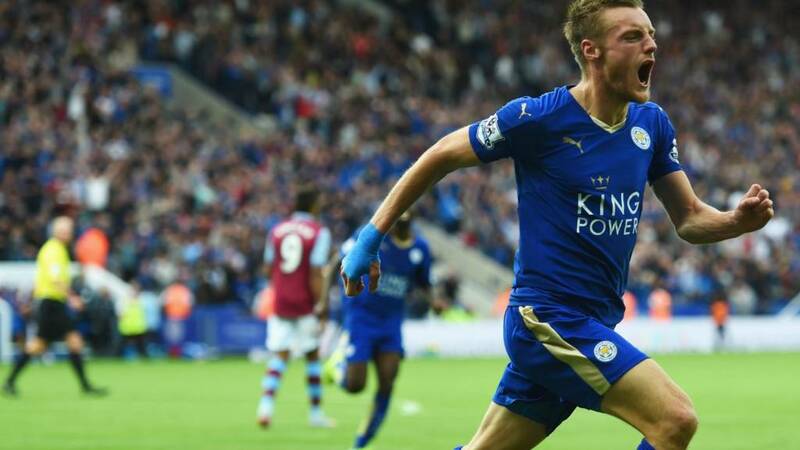 But Leicester have enjoyed just one win in their last five Premier League meetings with Aston Villa (D1 L3). With 20 minutes to go until kick-off you'd expect Tim Sherwood to be prepping his last-minute pre-match chat. Instead the Villa boss is alone with his thoughts in the corner of the tunnel, watching his players warm-up a few yards away. Five games into the season is no time to be making bold, sweeping predictions. But that is exactly what we want you to do. Which of these sides will finish higher in the table? What is a realistic aim? Who are their man rivals? If you're a fan, what would you be happy with? Former Leicester defender Matt Elliott: "The key to Leicester’s good start to the season has been that the Tinkerman hasn't tinkered. And why would he change something that was working well? "Claudio Ranieri's brought in good players to strengthen the squad but things look rosy at Leicester at the moment. They've followed on from their good form last season." Joleon Lescott and Micah Richards know each other well as former team-mates at Manchester City and England, and they are having plenty of chat as they go through a rigorous pre-match stretching exercise. Tim Sherwood mentioned in midweek that Lescott can have a similar impact to that of Robert Huth - who came in and steadied the Leicester ship so well last year. All over in the day's early game, which has set a low bar in terms of entertainment value. Ryan Mason's late goal the only strike of the game - you can follow full reaction in this page here. "Aston Villa have been struggling a bit since the start of this season, while Leicester can move into the top three with a win, who would have though that? They are really vibrant when playing at home. "Villa are a team in transition at the moment and they need something today. Christian Benteke leaving left them a bit short but Jack Grealish is a player Tim Sherwood really believes in and Joleon Lescott coming in is a good acquisition. "There's lots of talent there, but Villa need to start scoring quickly." Leicester, meanwhile, made an exciting addition (in my book) as they landed Swansea City winger Nathan Dyer on a season-long loan deal. Dyer is on the bench today. Pace. On Transfer Deadline Day Villa signed West Brom defender Joleon Lescott for a fee of up to £2m and Liverpool defender Tiago Ilori on a season-long loan. Villa paid £1m for the loan of Ilori, 22, with the option to sign him at the end of the season for between £6m and £9m depending on clauses. Lescott, 33, who has 26 England caps, has signed a two-year contract and makes his debut this afternoon. Villa also signed Anderlecht keeper Matija Sarkic, 18, on a three-year deal. As for Aston Villa's start to the season, after a very busy summer in the transfer market, both in and out, it's been a mixed bag. An away win on the opening day but just a point since. Losing Fabian Delph, Ron Vlaar and Christian Benteke was a massive ask for anyone, and now boss Tim Sherwood's Premier League managerial win % rate has fallen below 50% for the first time in his career (48.7%), the skids may be on. Or are we backing Tim to turn it around? Ryan Mason has put Spurs ahead as we enter the last 10 minutes at the Stadium of Light. "It can’t have been easy for Claudio Ranieri going in to follow on from Nigel Pearson. He was very popular with the fans and produced a miracle by avoiding relegation. "He’s not really changed a lot and that is sensible management. Since their fantastic start against Sunderland they've really built on that momentum." Villa make four changes, with Joleon Lescott in for his debut. He just needs Walsall and Birmingham to complete the West Midlands set. Leicester make two changes from the side which drew with Bournemouth a fortnight ago. In come Swiss midfielder Gokhan Inler and Japanese forward Shinji Okazaki. A very solid start to life back in the Premier League for Claudio Ranieri at Leicester as the Foxes have added to last season's late rally under Nigel Pearson. In the top six before the weekend, are Leicester now beyond fears of relegation? Nigel Pearson may have caused a few negative headlines for the club last season but he masterminded a truly great escape. So there were bemused faces all around as the Foxes brought the tinkerman back to England after an 11-year gap and following a woeful spell in charge of the Greece national side. But maybe Leicester chairman Vichai Srivaddhanaprabha knew what he was doing all along.